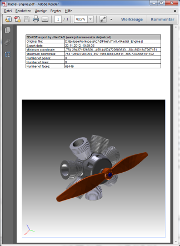 ... the Java-Application for viewing and converting CAD data. 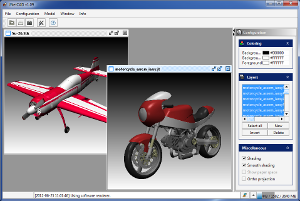 JNetCAD is a simple Java GUI for importing and exporting several CAD formats. Each im- and export module exists as JAR library and can be used separately in other projects. 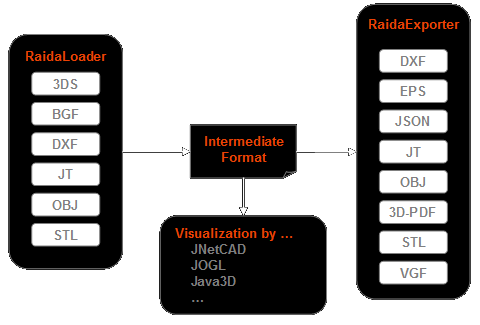 JNetCAD uses jRealiy for the visualization. Hence it provides a software renderer and a JOGL (Java binding for OpenGL) renderer. For the import libraries, exemplary Java3D and jReality renderer are included. At least Java version 1.5 is required. Here is an embedded example of the conversion from JT to JSON (WebGL). The original JT model has been found here: Radial_Engine.jt. A conversion to JSON (ASCII) results in 4,41 MB, a conversion to CTM (compressed binary) results in 0,33 MB. Both data formats contain exactly the same geometry! Click here for full screen with picking feature. Here is another conversion example of the above mentioned JT model Radial_Engine.jt. The resulting PDF file can be viewed by every Adobe Acrobat Reader (at least version 7). This conversion allows you to send your 3D model to any other people, knowing, that they can view it. The design and content of the PDF file is only an example and can be designed individually. All components can be used in non commercial or educational projects for free. For commercial use, please contact the author. It's possible to obtain either a licence or the source code. If you use this software for free or you find it usefull, please support further development of this software by a PayPal donation or a Flattr. RaidaCADAdapter v1.11 8.35 MB Adapter for all CAD loaders. 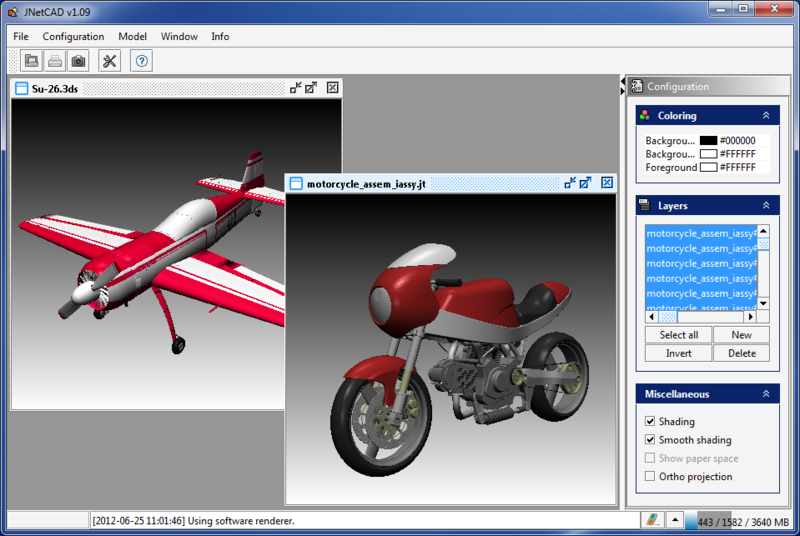 Allows to render every loaded CAD file with (Java3D,) JOGL or jReality (JOGL and software renderer). An example for the RaidaDXFLoader is integrated. Includes the JavaDoc for all CAD loaders. Click to see feature list and change log.